Being the other half of a pilot has us moving around Australia quite a bit – our latest destination is in the incredible Tropical North Queensland in Palm Cove – about 20 minutes from Cairns. With lots of visitors over the last 12 months (and plenty more to come) I thought I’d share my top 10 things to do when visiting. 1. View the magnificent Great Barrier Reef – You have never seen anything more spectacular than a birds-eye view of this natural phenomenon. 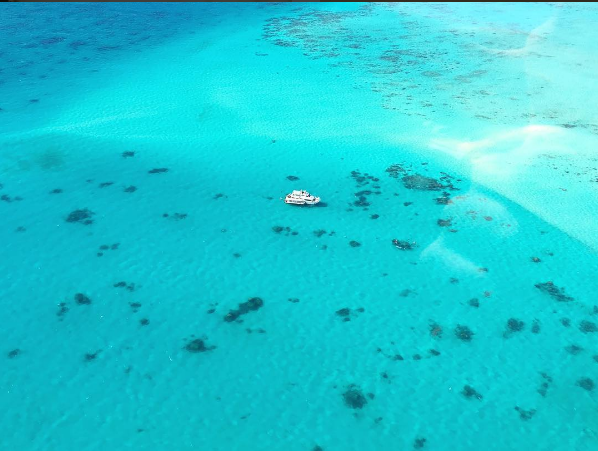 Whilst you can scuba, snorkel and dive seeing it from the air is absolutely breath taking. You can go via plane with GSL Aviation or by chopper with GBR Helicopters. Both are beautiful and you can tie in a boat trip out with a half day snorkel – so ask for some options. 2. Do the waterfall loop – as well as the reef, Cairns is on the doorstep of the rainforest. I’d suggest hiring a car and doing the loop around the Atherton Tablelands (this is better than the Daintree if you ask me!). A solid day would include stops at Lake Eacham, Millaa Millaa falls, lunch at the Mungalli Creek Dairy, then stop at Josephine Falls and if you have time the Babinda Boulders on your way back to Cairns. These are all picturesque swimming spots so pack your bathers. 3. A few nights in Port Douglas – just over an hours drive from Cairns is the cosmopolitan Port Douglas, reminiscent of Noosa there are lots of gorgeous shops, restaurants, the beach and the port. The Sunday markets are really high quality with lots to look at and buy. Port might be a better spot to place yourself if your interested in snorkelling the reef as access to the outer reef is much better from Port than Cairns. 5. Jungle Surfing the Daintree Rainforest – in the world heritage listed rainforest make your way to Cape Tribulation where you can do swing from canopy’s in the rainforest with Jungle Surfing. Learn about the animals and plants whilst you swing upside down and revel in the abundance of nature that surrounds you. Heaps of fun! 7. Snorkel the Great Barrier Reef – On the list for everyone and the best place to go out to the reef is from Port Douglas. Tie it in with a chopper flight or book with Quicksilver . The colours and clarity of the water is phenomenal, and if you don’t like swimming there are submarines that will take you down and you can view the reef and stay dry. 9. Witness the magnificent Barron Falls – move over Niagara Falls this is a sight to see! Only worth seeing during or just after the Wet Season after Cairns has had a heap of rain. To get there you can catch the skyrail or drive. The skyrail is slow and relaxed and takes you to Kuranda for the day, then back on the train – good if you don’t like walking to far. Otherwise take car and walk in.